Field research shows a correlation between pyrethroid resistance level in ABW populations and reduced efficacy of adulticides and larvicides from several insecticide classes. Jan 2019 | Albrecht M. Koppenhöfer, Ph.D.; Olga S. Kostromytska, Ph.D.; and Shaohui Wu, Ph.D.
Editor’s note: This research was funded in part by a grant to GCSAA from the Environmental Institute for Golf and by funding from the United States Golf Association. Widespread issues with insecticide resistance have made the annual bluegrass weevil (ABW), Listronotus maculicollis, one of the most difficult-to-manage turfgrass insect pests in North America (2, 4). Golf course superintendents have relied on synthetic insecticides for ABW management, primarily using broad-spectrum adulticides, especially pyrethroids, to control overwintered adults before egg-laying starts in spring (4), the only time during the ABW life cycle when only a single life stage is present. With growing awareness of pyrethroid-resistance issues, many superintendents have recently preferred to use the organophosphate chlorpyrifos (Chlorpyrifos, multiple manufacturers) for adult control. However, when used as adulticides, chlorpyrifos, as well as indoxacarb (Provaunt, Syngenta) and spinosad (Conserve, Dow AgroSciences), were found to be less toxic to adult ABW from pyrethroid-resistant populations in laboratory and greenhouse assays (2). ABW populations may also be managed with insecticides that target the larvae. Young larvae initially feed inside stems, causing moderate damage. Older larvae (fourth and fifth instars) cause severe damage by feeding externally on the grass crowns. The larvae can be targeted with systemic insecticides (diamides, neonicotinoids) when small and with systemic (see above) and non-systemic insecticides (spinosad, indoxacarb and the organophosphate trichlorfon [Dylox, Bayer]) when feeding externally (1). 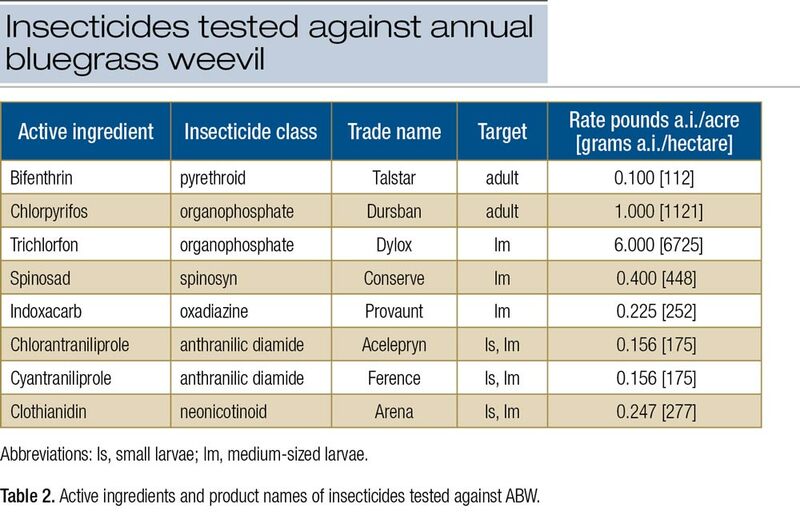 However, a summary of numerous field efficacy tests indicates that several larvicides (indoxacarb, trichlorfon, the diamide chlorantraniliprole [Acelepryn, Syngenta] and the neonicotinoid clothianidin [Arena, Nufarm]) may also be less effective against pyrethroid-resistant populations than against pyrethroid-susceptible populations (1). The limited number of field observations on insecticide resistance in ABW populations stems from product-efficacy testing trials (1). These tests were not designed to truly understand how resistance affects insecticide efficacy, and the resistance in test populations was inferred based on the performance of pyrethroids included among the treatments (1). Therefore, the objectives of the present study were to (1) expand observations on insecticide resistance in ABW to the larval stage; (2) confirm laboratory and greenhouse observations on resistance in adults and larvae under field conditions; and (3) examine the effect of pyrethroid-resistance level on the efficacy of important insecticides used for the management of adults and larvae. Six ABW populations with different levels of pyrethroid resistance as determined in previous studies with adults (2) were used. The population from Rutgers Horticultural Farm No. 2 (HF; North Brunswick, N.J.) had the lowest LD50 value (lethal dose killing 50% of the test population) for bifenthrin in topical assays and was thus considered the most susceptible population. Based on their resistance ratios (RR50; ratio of LD50 of test population to LD50 of the most susceptible population), the other populations were categorized as susceptible (RR50 2: PB, Manalapan, N.J.; HP, Howell, N.J.), moderately resistant (RR50 31: GB, Somers Point, N.J.), resistant (RR50 95: EW, River Vale, N.J.) and highly resistant (RR50 343: LI, Glen Cove, N.Y.) (Table 1). Field experiments targeting overwintered adults and young and mid-sized larvae of the spring generation were conducted at four golf courses in 2015 (HP, GB, EW, LI) and five golf courses in 2016 (PB, HP, GB, EW, LI) in fairway areas with a history of ABW problems (Table 1). In all experimental areas, the grass was a mixture of about 20%-50% Poa annua and 50%-80% creeping bentgrass (Agrostis stolonifera) and was mowed at 0.5 inch (13 mm). Plot areas were managed by the golf course staff following the same standard procedures as for the rest of the fairways, but were not treated with insecticides until after experimental evaluation. Treatment timing was determined using a combination of indicator plant phenology, growing degree day accumulation (base temperature 50 F [10 C], starting March 1; GDD50) and ABW phenology. Bloom of three indicator plants (forsythia, Forsythia species; flowering dogwood, Cornus florida; hybrid Catawba rhododendron, Rhododendron catawbiense) was observed in regular visits. GDD50 accumulations were calculated based on data obtained from the nearest weather station for each golf course. Adult densities were estimated weekly by taking four 10-second vacuum samples from the start of full bloom of forsythia until past the peak of adult densities. Larval populations were monitored weekly from late-bloom dogwood through late-bloom rhododendron by taking 30 soil-sod cores (including grass, thatch and the soil below it to a total depth of 1.5 inches) and extracting ABW stages (see below). Applications were made with a CO2 backpack sprayer with a flat-fan nozzle at 30 pounds/square inch (207 kPa) pressure in 2 gallons/acre (823 liters/hectare) spray volume. Treatments were immediately watered in with overhead irrigation. Untreated control plots received only overhead irrigation. Treatments were arranged in a randomized complete block design and replicated six times per trial. Insecticides targeting adults and larvae were evaluated in different experiments that were arranged immediately adjacent to each other. A fifth-instar annual bluegrass weevil larva. Treatments were evaluated around 700 GDD50 (early June) when most individuals of the ABW spring generation were in the fourth to fifth instar. From each replicate, eight cores (2.25 inches [5.7 cm] diameter × 1.5 inch [4 cm] depth) were taken, and ABW stages were extracted by submerging the cores (split into four pieces) for one hour in lukewarm saturated table salt solution. Data were the combined number of larvae (all stages), pupae and teneral (not fully sclerotized) adults per replicate. Mature adults were not included because, at the time, they were likely to have originated from the overwintering generation and might have migrated into the replicates from adjacent areas after residual effects of treatments had subsided. Adulticides were sprayed when densities of overwintered adults peaked, when Forsythia species were about 50% gold (bloom):50% green (leafing out), and growing degree days were 100-120 GDD50. Individual replicates consisted of 5-foot × 5-foot (153-cm × 153-cm) areas separated from adjacent replicates by 1 foot (31 cm) on each side. Treatments were bifenthrin, chlorpyrifos, indoxacarb and spinosad (Table 2). Adulticides were watered in with 0.04 inch (1 mm) of overhead irrigation. When used against the susceptible (HP, PB; Figure 1A) and moderately resistant (GB; Figure 1C) populations, all treatments significantly reduced ABW counts, with no significant differences among treatments (42%-69%). No treatment provided significant control against the resistant (EW; Figure 1E) and highly resistant (LI; Figure 1G) populations (Figure 1). No significant decrease in control in the resistant populations was observed for chlorpyrifos when insecticide efficacy was compared among populations. Spinosad efficacy was significantly lower against the LI population than against the susceptible and GB populations, with the EW population not differing from any other population. Bifenthrin efficacy was significantly lower against the LI population than against all other populations. Indoxacarb efficacy was significantly lower against the EW and LI populations than against the susceptible and GB populations. Early larvicides targeting the young larvae inside the plants were applied around the time of late bloom to just past bloom of dogwood (200 GDD50). Late larvicides targeting the older larvae outside the plants were applied around the onset of full bloom of rhododendron (400 GDD50). Individual replicates consisted of 3-foot × 3-foot (92 cm × 92 cm) areas separated from adjacent replicates by 1 foot (31 cm). Treatments were the early larvicides chlorantraniliprole, cyantraniliprole and clothianidin, and the late larvicides chlorantraniliprole, cyantraniliprole, clothianidin, indoxacarb, spinosad and trichlorfon. Early larvicides were watered in with 0.1 inch (2.5 mm) of overhead irrigation, and late larvicides with 0.2 inch (5 mm). Against the susceptible populations (HP, PB; Figure 1B), all treatments significantly reduced ABW counts, with the late cyantraniliprole application (93%) being the most effective and the late clothianidin application (45%) the least effective. Against the moderately resistant GB population (Figure 1D), all treatments provided significant control, with spinosad (88%) being the most effective and the late clothianidin application (47%) the least effective. Against the resistant EW population (Figure 1F), all treatments except the early clothianidin (5%) and early chlorantraniliprole (19%) applications provided significant control, with the cyantraniliprole applications (91%-94%) being the most effective. Against the highly resistant LI population (Figure 1H), only the cyantraniliprole applications (76%-86%) and spinosad (65%) significantly reduced ABW counts. The only treatments not significantly affected by the resistance level were the early (83%-91%) and late (76%-94%) cyantranili­prole applications, spinosad (64%-88%), and the late clothianidin application (10%-47%). Indoxacarb (21%-80%) provided significantly lower control against the LI population than against other populations. The late chlorantraniliprole application (8%-64%) was significantly less effective against the LI population than against the susceptible and GB populations. The early clothianidin application (6%-57%), the early chlorantraniliprole application (17%-71%) and trichlorfon (25%-73%) provided significantly less control against the LI and EW populations than against the susceptible and GB populations. Our study clearly showed pyrethroid resistance in adult ABW under field conditions. Control of ABW by bifenthrin was significantly lower against the highly resistant populations than against the susceptible populations. However, bifenthrin showed no significant control of either the highly resistant or the resistant populations. Under greenhouse conditions, bifenthrin efficacy against adults from the same populations clearly declined from the susceptible to the moderately resistant and from the resistant to the highly resistant populations (2). Chlorpyrifos is not an effective adulticide alternative to pyrethroids against pyrethroid-susceptible and pyrethroid-resistant populations. While the decline in efficacy against the resistant populations was statistically not significant, chlorpyrifos provided no significant control of resistant and highly resistant populations and only 50% control of susceptible populations. Under greenhouse conditions, chlorpyrifos efficacy against adults of the same populations clearly declined from the susceptible to the moderately resistant and from the resistant to the highly resistant populations (2). When used against adults, indoxacarb and spinosad showed a similar decline in efficacy with increasing pyrethroid-resistance level in our study, but overall tended to be somewhat less effective than bifenthrin. In the present study, adulticides no longer provided significant control starting at a bifenthrin RR50 of 95, but unsatisfactory performance of adulticides seems to become obvious to golf course superintendents starting at bifenthrin RR50s of about 50. Among the larvicides tested, only cyantraniliprole and spinosad were not significantly affected by resistance. Indoxacarb efficacy declined only against the highly resistant population, but it declined by 55%. Efficacy of chlorantraniliprole, clothianidin and trichlorfon declined by 32%-48% against the resistant population and even more against the highly resistant population. These observations are consistent with observations in previous field efficacy tests against suspected pyrethroid-resistant ABW populations (1). The pattern of insecticide efficacy against ABW populations with different resistance levels may vary somewhat between different golf courses based on their specific history of insecticide use. Nonetheless, the findings in this study combined with previous observations (1, 2) show a robust pattern that can serve as a basis for recommendations for ABW control at different pyrethroid-resistance levels. In view of the serious resistance issues, the first recommendation for ABW management is to minimize synthetic insecticide applications both in space and time as much as possible, whether managing susceptible or resistant populations. This goal can be achieved more easily by following the second recommendation, which is to shift control measures from management of adults to management of larvae. This allows for more informed decisions on the need for applications, because early larvicides allow for monitoring adults past their peak densities in spring, and late larvicides allow for monitoring of actual larval densities. For ABW populations with bifenthrin RR50s above 50, management efforts should concentrate on larvae, using the remaining effective larvicides: cyantraniliprole, spinosad, indoxacarb and, if still effective, trichlorfon and chlorantraniliprole. 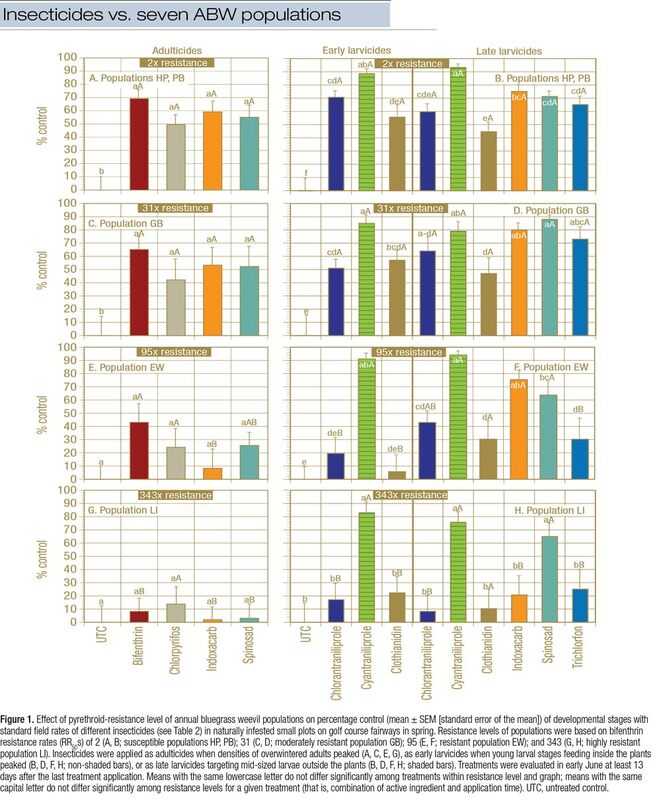 Against populations with bifenthrin resistance RR50s above 100, biological, biorational and cultural control alternatives in rotation with the remaining effective synthetic insecticides cyantraniliprole, spinosad and, if still effective, indoxacarb should be used to delay further resistance development. To help implement these management recommendations, we have developed a simple petri dish test using formulated bifenthrin and chlorpyrifos that has sufficient discriminating power, accurately reflects resistance levels and is easy to conduct (3). This test could be used by consultants and diagnostic laboratories to help golf courses determine the resistance level of their ABW populations. This research was funded by GCSAA and supporting chapters and associations (GCSA of New Jersey, Long Island GCSA, Metropolitan GCSA, New Jersey Turfgrass Association, and Connecticut AGCS), the USGA, the New York State Turfgrass Association, the O.J. Noer Research Foundation, the Rutgers Center for Turfgrass Science, and the USDA National Institute of Food and Agriculture, Hatch Multistate projects 0206130, through the New Jersey Agricultural Experiment Station, Hatch Multistate project NJ08295. The authors also thank the participating golf course superintendents and their clubs for their cooperation. This article was based on a paper, “Pyrethroid-resistance level affects performance of larvicides and adulticides from different insecticide classes in populations of Listronotus maculicollis (Coleoptera: Curculionidae),” written by A.M. Koppenhöfer, O.S. Kostromytska and S. Wu and published in 2018 in Journal of Economic Entomology (111:1851-1859). When used against ABW adults, the insecticides bifenthrin, chlorpyrifos, indoxacarb and spinosad are similarly affected by resistance, becoming ineffective at bifenthrin RR50s of 95 and above. When used against ABW larvae, the insecticides chlorantraniliprole, clothianidin and trichlorfon are similarly affected by resistance, becoming ineffective at bifenthrin RR50s of 95 and above. When used against ABW larvae, the insecticide indoxacarb is ineffective at bifenthrin RR50s of 343. To date, ABW larvae have not shown resistance to the insecticides cyantraniliprole and spinosad. Koppenhöfer, A.M., S.R. Alm, R.S. Cowles, B.A. McGraw, S. Swier and P.J. Vittum. 2012. Controlling annual bluegrass weevil: optimal insecticide timing and rates. Golf Course Management 84(3):98-104. Kostromytska O.S., S. Wu and A.M. Koppenhöfer 2018. Cross-resistance patterns to insecticides of several chemical classes among Listronotus maculicollis (Coleoptera: Curculionidae) populations with different levels of resistance to pyrethroids. Journal of Economic Entomology 111:391-398. Kostromytska, O.S., S. Wu and A.M. Koppenhöfer. 2018. Diagnostic dose assays for the detection and monitoring of resistance in adults from Listronotus maculicollis (Coleoptera: Curculionidae) populations. Journal of Economic Entomology 111:2329-2339. McGraw, B.A., and A.M. Koppenhöfer. 2017. A survey of regional trends in annual bluegrass weevil (Coleoptera: Curculionidae) management on golf courses in eastern North America. Journal of Integrated Pest Management 8:1-11. Albrecht M. Koppenhöfer is an Extension specialist in the Department of Entomology, Rutgers University, New Brunswick, N.J. Olga S. Kostromytska is an Extension assistant professor in the Stockbridge School of Agriculture, University of Massachusetts, Amherst, Mass. Shaohui Wu is a postdoctoral researcher in the Department of Entomology, University of Georgia, Tifton, Ga., and USDA-ARS, Southeast Fruit and Tree Nut Research Unit, Byron, Ga.